Published by Microsoft and developed by Ensemble Studios, the long running Age of Empires series sets something of a benchmark when it comes to real time strategy games. The games spend plenty of time in development with the result that a new one is always something of an event. 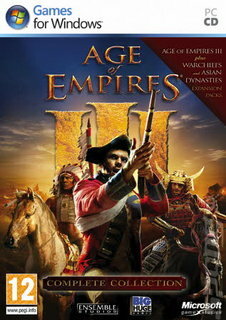 Age of Empires III moves forward in time a little bit, and concerns itself with the rush for conquests, riches and discoveries that took hold of Europe in a time where new lands and people were constantly being discovered. You control a colonising European force but you are linked to your motherland by your home city, a complex, teeming centre that can supply you with reinforcements as you need them. You can also use technologies learnt on your adventures in the colonies to customise you home city, and opinion there acts as a barometer for your progress. Fully 3D graphics and lush, destructible environments make this truly one of the best looking RTS games weve seen, and it adds richness and flavour to the different nations you can take charge of. All the big colonial players are represented: Portugal, England, Holland, France, Germany, Spain, Russia and the mighty Ottoman Empire. Change the course of history as you struggle for control of the rich New World. Also featured are the Native Americans, and they are not to be underestimated. Ally with a tribe and youll effectively have two civilisations under your control, with the tribe able to make its own moves as a separate entity. Theres also a campaign that lets you take control of a notional character by the name of Morgan Black. The fellow has a knack of pitching up in all the hotspots of colonial history, and generally sides with the underdog. So it is that youll find yourself helping the Aztecs ward off the greedy, marauding Spaniards, set the British against the French in the Indian War and aiding the revolutionary Simon Bolivar in his quest to liberate South America. There are some twenty four different scenarios in all. Bolstering things in the Complete Collection are two huge great expansions to get to grips with - The Asian Dynasties and The WarChiefs. Naturally youll expect some kind of multiplayer support and AoE III is the last word in online communities, with a sophisticated system that supports players with features both during the battle and after it. The welcome return of a leading light.